the project needed to reflect the unique relationships between the institution’s three pillars, the Hospital, the Foundation and the Auxiliaries. Planned Legacy’s approach to the project centered on getting to know Overlake, following our belief that the best way to understand an installation is to understand the culture comprising the institution. Design followed shortly after preliminary meetings and an extensive site visit. 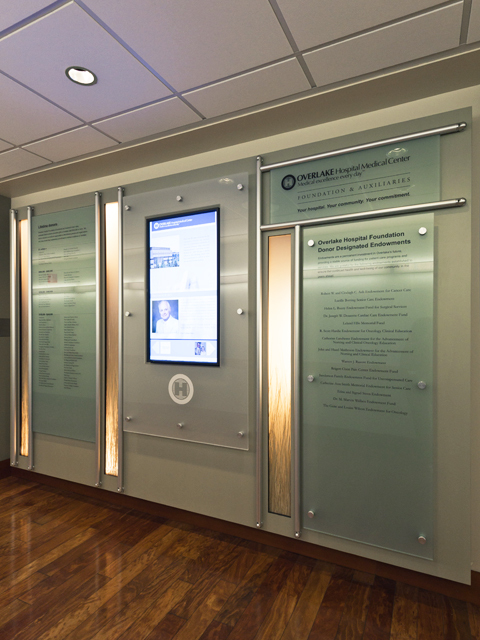 The display was designed in two major sections — 21’ 9″ wide and 12’ wide — to best marry the architectural elements of the corridor location’s hefty vertical columns with the display’s content requirements. Both sections feature linear components and a series of rectangular tempered glass panels, placed in horizontal and vertical alignments. 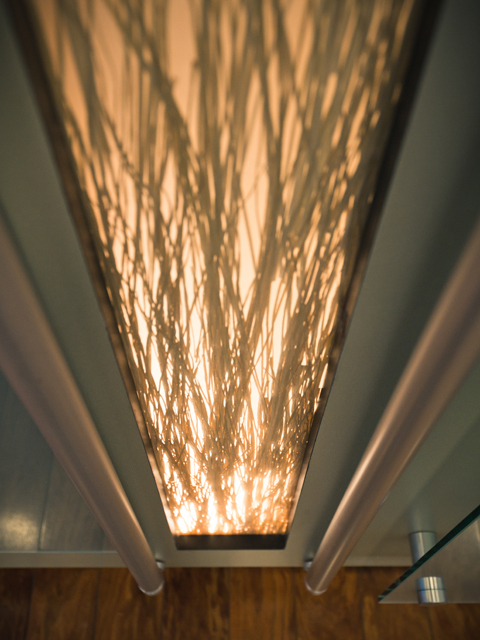 Providing additional continuity are the vertical light-boxes which feature bear-grass ensconced in an eco-resin. These panels provide a warm Earthy element without compromising the sterility of the hospital environment. 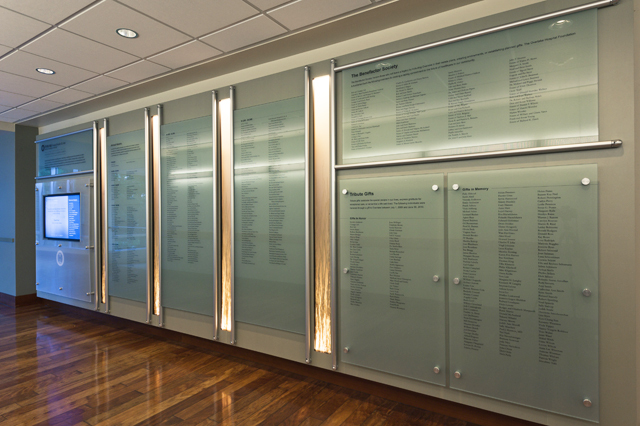 The larger wall’s glass panels feature information about the Foundation and Auxiliaries, Annual Donors Lists and Benefactor information as well as Honorarium and In Memory listings. Anchoring the section, on the far left, is a 40″ interactive touch-screen display in a landscape configuration. The multimedia presentation provides an immersive destination with five modules. 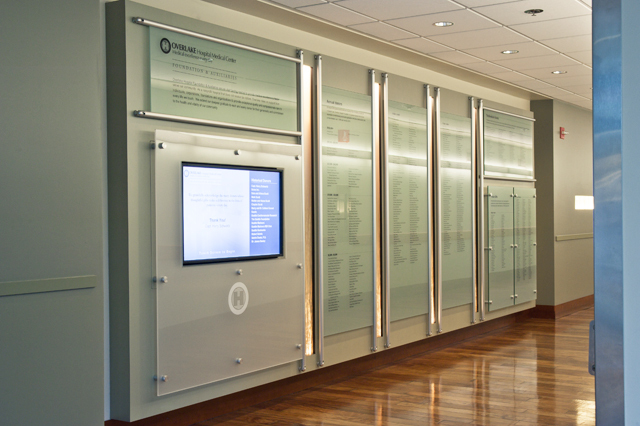 The smaller wall was dedicated to Major Donors, including lifetime donors over $100,000 and a listing of endowments. 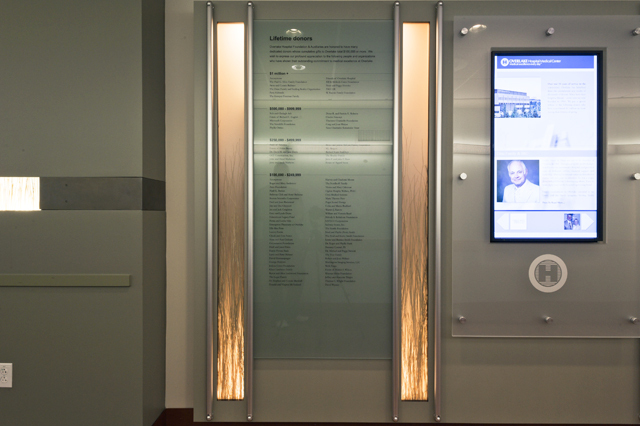 The centerpiece of the wall is a 40″ interactive touch-screen display in portrait configuration, which honors million dollar plus donations. The multimedia is narrative in nature and shares the stories behind the generosity of the institution’s largest supporters. 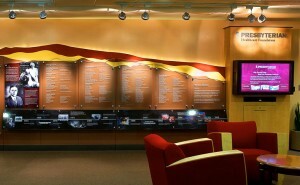 The photos in the donor wall gallery above are the work of professional photographer Garland Cary. You can view more of Garland’s photos online at http://www.GarlandCary.com and http://ww.flickr.com/photos/kabeluna/. Thanks Garland! 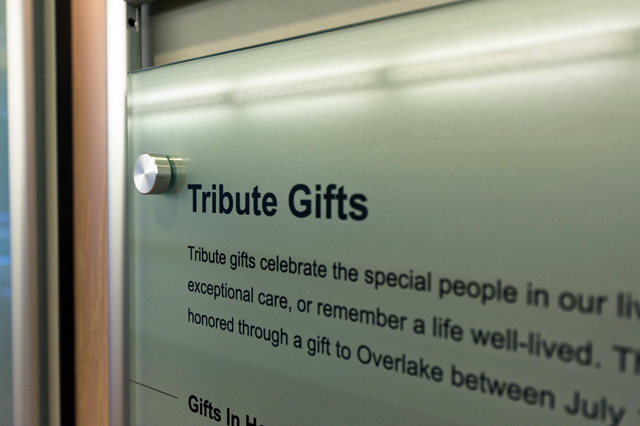 For more information on the Overlake Hospital Medical Center donor recognition walls, or to discover what Planned Legacy interactive donor walls, recognition displays and capital campaign promotion systems can do for your organization, please call Planned Legacy Toll Free at 1. 866.882.3580 or e-mail solutions@plannedlegacy.com. 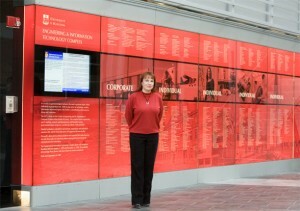 Donor wall with interactive multimedia presentation. Presbyterian Hospital Foundation. Albuquerque, New Mexico. Planned Legacy was selected by the Presbyterian Healthcare Foundation of Albuquerque, New Mexico, to design an integrated donor recognition display that would elevate the Foundation’s message and achievements to a new level. 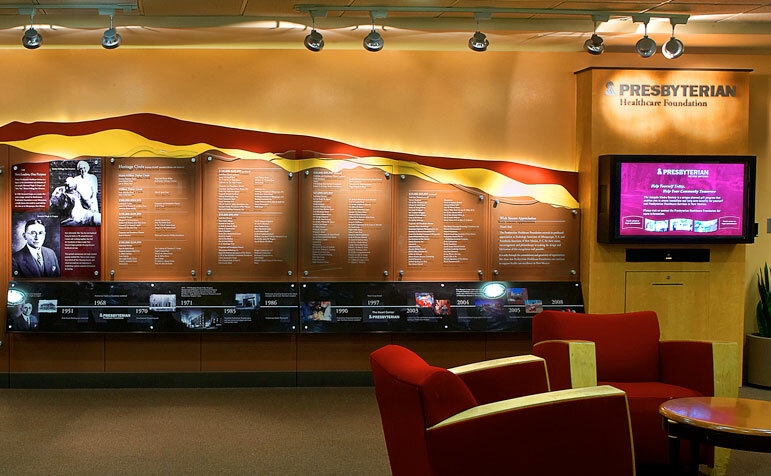 Blending natural hues with indirect lighting, Planned Legacy captured the colors and textures of the surrounding landscape and Sandia Mountains to create an inspiring panorama for the architectural component of the display. 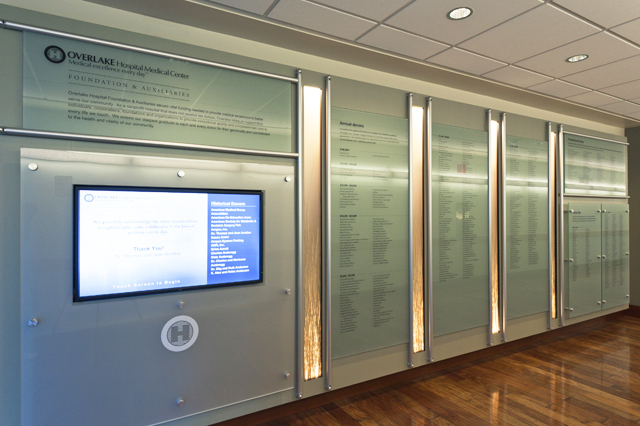 Glass panels, a photomural and historic images were blended in to celebrate donors, honour early Hospital leaders and promote the Foundation’s achievements and activities. 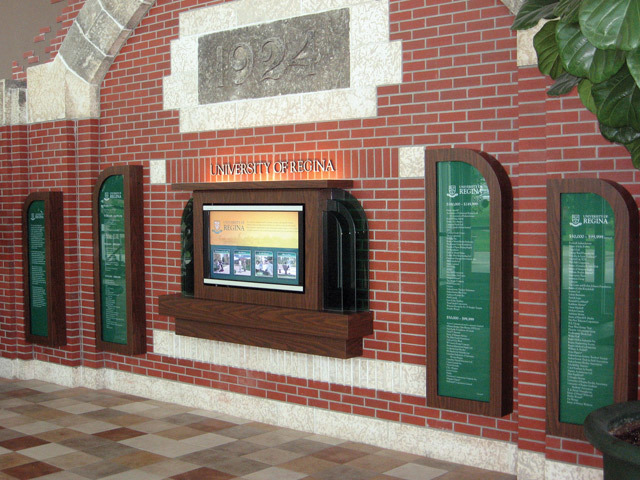 To compliment the recognition display and attract visitors, staff and contributors at first point of contact, a 40″ touch-enabled LCD screen complete with interactive multimedia presentation was added. The presentation showcases the Foundation, its leadership and vision using a combination of text, photos and video. 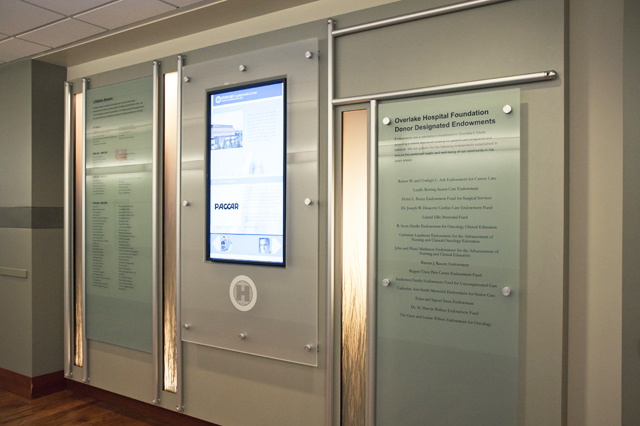 Visitors to the display can search donor profiles and names, watch video clips of noteworthy individuals and events, and even make a contribution to the Foundation by using a secure credit card swipe that transmits information instantly to the Foundation office. For more information on the Presbyterian Healthcare Foundation donor wall and other donor recognition projects Planned legacy is working on for their Foundation, or to discover what Planned Legacy interactive donor walls, recognition displays and capital campaign promotion systems can do for your organization, please call Planned Legacy Toll Free at 1.866.882.3580 or e-mail solutions@plannedlegacy.com. Multimedia presentations are well known for their superior attraction capabilities in the retail space and they also work exceptionally well in the non-profit world, but there are differences, and selecting the right vendor can be critical to your long-term success. If you’re thinking about adding a multimedia component to your current donor wall or donor recognition display, whether it be standalone or integrated, self-cycling or interactive, the following questions will assist you in doing your due diligence with regards to vendor selection. Do they have experience in the non-profit sector? Is designing and manufacturing donor recognition displays with multimedia presentations their core business? Will they be subcontracting the work or doing the multimedia presentation design and programming themselves? Do they have actual examples and references for interactive and/or self cycling multimedia projects they have completed? Can they design and fabricate the display? Can they design and integrate the multimedia presentation? Are they a one-stop shop? Do they have multimedia designers and in-house writers to assist with content creation? Can they help you through a content development process that includes text, graphics, video, photographs, audio, archived information, storyboarding and multimedia layout? Can they clearly explain the different types of multimedia display hardware options? Do they have practical experience in the setup, monitoring and supporting of remote networks? Is their database structure scalable? Can it handle an unlimited number of records and search queries? How will they back up your records? Can they restore them if necessary? Can they provide an image of the most recent version of your multimedia presentation and database? How quickly can it be created? Do they have practical experience working with the diverse types of lighting necessary for different displays and locations? Have they worked with donor management software? What do they offer in the way of security for your system and data? Can their system measure visitor usage, areas visited, times and lengths of visits etc. on your multimedia presentation? What kind of reports does their system provide? How is content managed? Can it be updated and edited remotely from any network-connected computer or are updates made manually via CD or DVD? Does it require technical expertise? How will system performance be monitored on a 24/7 basis? How will any issues be addressed? Can the multimedia (and other) components of their system be integrated into your current Web site? Can they answer any technical questions posed by your engineers, architects, development staff and IT professionals? If you receive positive answers to all of the above questions you have probably found yourself a vendor that can truly help you create the ultimate multimedia donor recognition display – a destination that your donors, volunteers, staff and board members will be proud of! Questions you need answered? Please e-mail us at solutions@plannedlegacy.com or call Toll Free 1 (866) 882-3580. St. John’s Regional Medical Center in Oxnard, California recently unveiled their new Legacy Of Caring donor recognition display, designed, fabricated and installed by Planned Legacy. The display features six vertical, self-standing panels, each one a mini display unto itself. 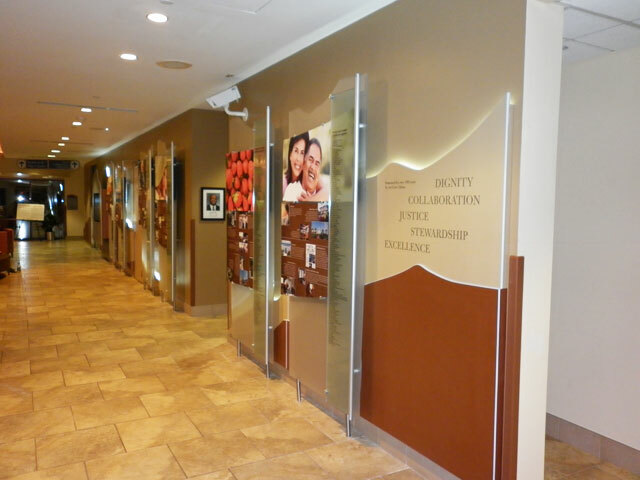 Standing approximately 6’ high x 3 ½’ wide, each panel presents its own historical overview of the hospital and the region, including a historical timeline, iconic images of local Ventura County and donor names of specific gift categories. The panels are constructed using a variety of materials, including frosted glass for the background and donor panels and clear glass with printed vinyl film for the historical and background photos. 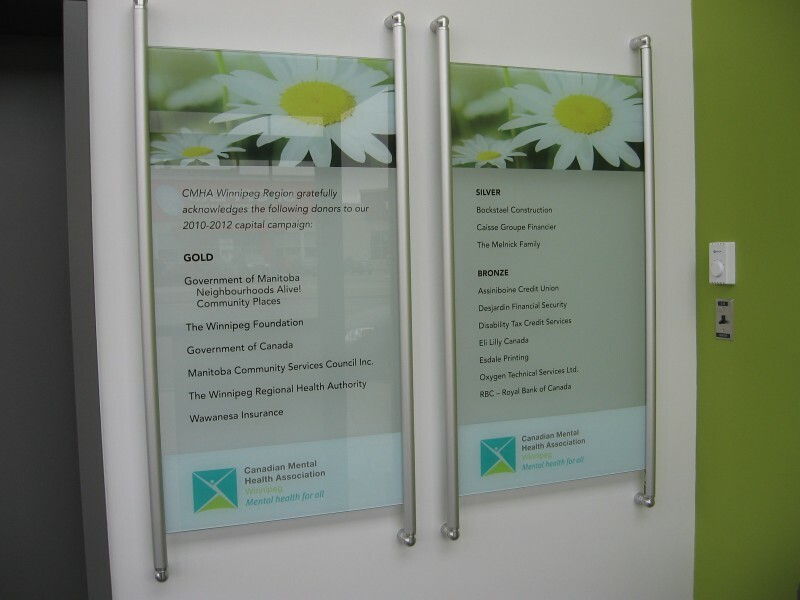 The photos and donor panels are attached to the back panels with brushed stainless steel edge grips. Accenting the overall display are colored acrylic panels that complement the décor of the hospital’s new lobby and serve as a striking backdrop to the display that runs the length of this new lobby area. 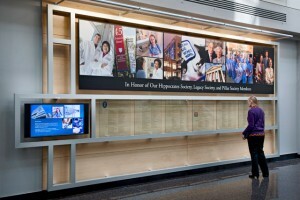 Most prominent is the large 52” LCD monitor at one end of the display, showing a self-cycling multimedia presentation which the hospital can easily update using the Planned Legacy Web-based Content Management System. The monitor is housed in a custom designed enclosure that features the St. John’s Healthcare name and logo in raised CNC lettering. 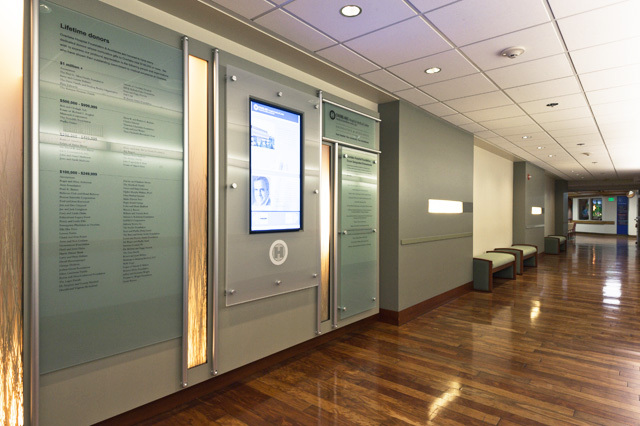 The complete display is illuminated with strategically placed track lighting that draws visitors to the presentation, which has become a popular destination within the hospital. For more detailed information on the St. John’s Healthcare Foundation donor recognition project please call Planned Legacy Toll Free at 1.866.882.3580 or e-mail solutions@plannedlegacy.com. 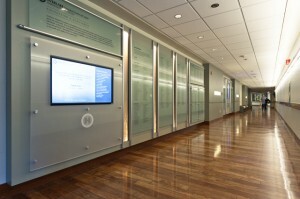 When the Faculty of Engineering at the University of Manitoba planned its new Engineering and Information Technology Complex (EITC) they wanted a donor wall that not only honored contributors to the project’s capital campaign and celebrated the Faculty’s 100th Anniversary, but also one that reflected the school’s technical leadership and innovation. Working from a concept design developed by Stantec Engineering, the EITC architects, Planned Legacy realized early in the process that taking a drawing of a 50’ long, illuminated glass wall from paper to reality would present significant challenges, but none that could not be overcome. First, the Planned Legacy team had to create a system that would provide even lighting without hot spots over the wall’s entire length and height. This meant sourcing a special flat paint to diffuse light off the back wall and designing light enclosures that would allow easy access for maintenance and sufficient ventilation. Additionally, because the spacing for lighting was limited, a North American search was required for 24 fixtures small enough to fit into a confined area. In addition to addressing the lighting challenge, Planned Legacy also needed to engineer a structure that would support 12 large 10 ml glass panels, each about 200 lbs. in a manner that would be stable but still allow for some natural shifting. To make things even more interesting, part of the wall was situated beside a staircase with only 16” of access. 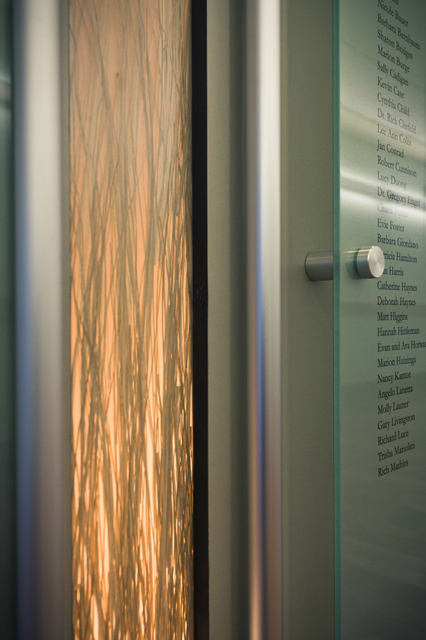 And finally, working closely with a high end graphics company, Planned Legacy was able to devise a method of applying the donor names and other information to the glass panels seamlessly, using the correct shade of red. The end result is a striking recognition display that achieves all of the technical and aesthetic objectives set out, on time and on budget! 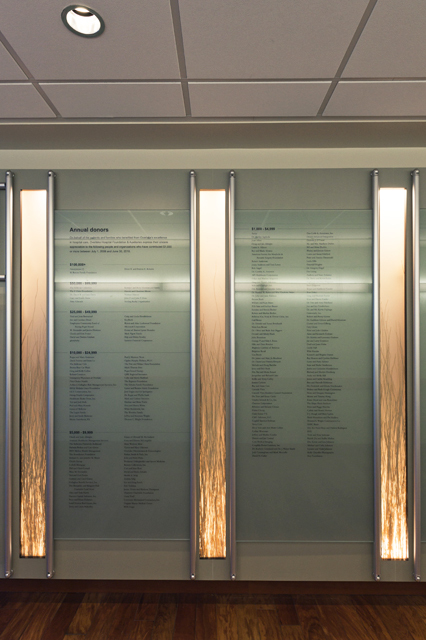 For more detailed information on the University of Manitoba Faculty of Engineering donor wall project please call Planned Legacy Toll Free at 1.866.882.3580 or e-mail solutions@plannedlegacy.com.